Makin’ Lemonade is our new blog series where we interview Youth Ventures participants on what inspired them to start their business, their biggest challenges, their successes and their dreams for their ventures. 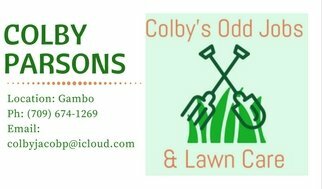 Today we are chatting with Colby from Colby’s Odd Jobs based in Gambo, NL. Colby’s Odd Jobs and Lawn Care. My business is just starting up this year. I will be offering lawn care or anything from taring a driveway to cleaning a house. I started my business because I am not the type that wants to laze around the house all day, so this would give me something to do during summer. I also started my business to make a little bit of money for myself. How did Youth Ventures help? Youth Ventures helped me my making business cards and shirts to help. What is your dream for your venture? My dream for my venture would be to grow up and extend on my little business that I have started now. What do you enjoy most about owning your own business? I enjoy dealing with the paper work, money and very much enjoy helping people out around town. At the end of the day I love everything I do. What were the greatest challenges in getting started? Some of the things that were hard for me to over come at first was spending money on new equipment and having to pay back money. Also trying to get a good for the business. My biggest success so far would be paying off my equipment and getting a good name. My advice is to do something different and put your mind and work ethic into it. The next thing for my business is to get more and more work lined up so I don’t have to work. Also to get top of the line equipment. How can people buy your products or book your services? People can contact me and say can you come look at my lawn for me. To learn more about what Youth Ventures can do for you, check out our website https://youthventuresnl.com/get-started/.